The city of Ottawa, Canada’s national capital, has not had a live professional boxing card in over forty years. So is boxing dead in that city? Far from it. 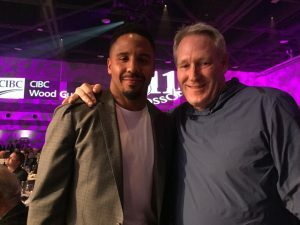 In the last twenty-four years, some of boxing’s greatest fighters have headed north to participate in ‘Ringside for Youth.’ The city’s annual fundraiser helps support the Boys and Girls Club of Ottawa. The money raised is divided amongst seven at-risk neighbourhoods across the city. The Club’s four key programming pillars are Education, Physical Activity, Leadership and Social Skills, and Creative Arts. In 1994, Ottawa investment advisor, Steve Gallant, decided to volunteer his skills and find a way to raise money to support youth organizations in Ottawa. His idea was to make a connection with youth and professional boxing. Few people thought much of this bizarre idea. After all, this wasn’t Philadelphia or Los Angeles, cities with a strong boxing history. This was Ottawa, a government, white collar city. Gallant proved to be incredibly perceptive. He recognized that people from all walks of life have a fascination with legendary boxers and that those same boxers tend to have a soft spot in their hearts for kids. He saw this as a perfect recipe for success. Heavyweight title challenger, George Chuvalo, was the special guest at the first ‘Ringside for Youth’ event. He told his story and fight fans were then entertained by watching a card featuring the city’s top amateur fighters. Since that time, some of the former greats who have come to Ottawa to share their stories include: Jake La Motta, Aaron Pryor, Roberto Duran, Ray Boom Boom Mancini, Marvin Hagler, Joe Frazier, Lennox Lewis, Evander Holyfield, Thomas Hearns, and Sugar Ray Leonard. Flash ahead twenty-four years later to June 7, 2018 and undefeated, two division world champion Andre Ward adds his name to the list of greats who have shared their stories while attending this event. Ward said he had heard about the charity event and that his boxing idol, Roy Jones Jr., had once been the guest of honour. Needless to say, he felt a sense of accomplishment when he received this year’s invitation. ‘Ringside for Youth’ has continued to grow every year, becoming a staple on the social calendar of Ottawa’s elite. The event is unique in that it brings together a very eclectic crowd. Government workers dressed in suits share tables with professional hockey players and hard-core boxing fans. Numerous Ottawa Senator players were in attendance, including former 17 year NHL veteran Chris Neil, a man who knows a thing or two about fighting, having been involved in more than two hundred fights in his hockey career. When professional athletes come out just to hear another professional athlete speak, you know you have hit on a winning formula. According to former heavyweight title challenger, Gerry Cooney, “I could have used a place like the Boys and Girls Club of Ottawa when I was a kid.” Cooney, a long time supporter of ‘Ringside for Youth’, now spends his time working with young people himself in Patterson, New Jersey. The evening also featured a wonderful meal, live music, a silent auction, and a card of amateur fights that pitted local fighters from Ottawa’s Beaver Boxing Club against boxers from Gothenburg, Sweden. It seems like Steve Gallant’s idea wasn’t so crazy after all. Andre Ward had the opportunity to practice telling his story before a full house. A story he will soon tell again one day when he becomes inducted into the Boxing Hall of Fame. Boxing fans had an opportunity to be in the presence of greatness and a large amount of money was raised for the children of Ottawa. It is not hard to continue a tradition when everyone involved walks away a winner.